Bundled up tight and clutching mugs of hot chocolate, we wondered thoughtfully through the fragrant pine forest. Finally, just as the snow started to pick up, one of us would spot it -- the perfect tree. It was always my brother or me who spotted the tree, but somehow I'm sure my dad pointed us there (or maybe we just spotted every tree until we got the nod). When my dad crouched beneath this magical tree with his saw, I never failed to feel a pang of guilt. Surely we shouldn't be cutting down a tree? Trees are important. Didn't we just plant a tree on Arbor Day? As a child, these pangs of guilt were short lived and immediately washed away by the warmth and glitter of decorating day. As an adult, though, the environmental impact of my choices is important to me. A 2011 study revealed a neck-and-neck (or trunk-and-trunk, if you will) race between real and artificial trees for environmental supremacy. In the long run, the habits of the individual consumer have weigh much more into the sustainability of either option than do the trees themselves. 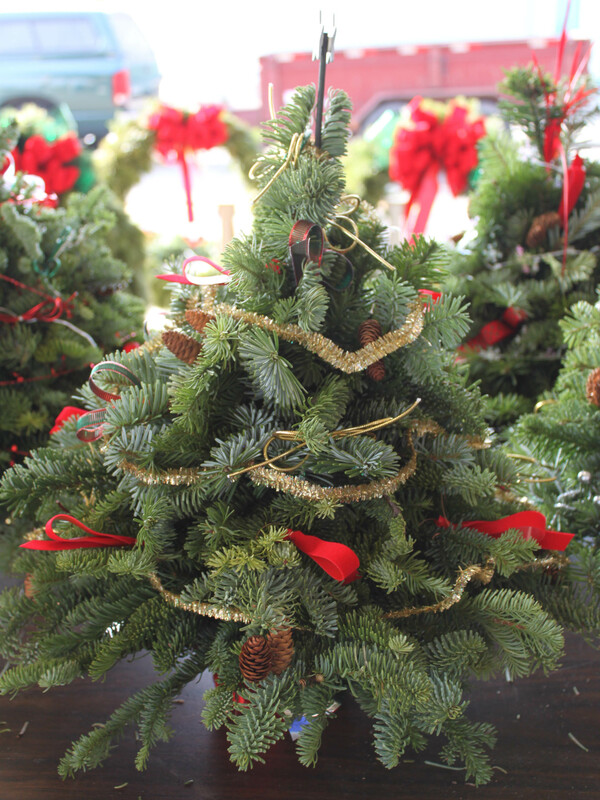 Rows upon rows of fresh trees, wreaths, garlands, and other decorations are available every day at Detroit's Eastern Market at this time. Both real and artificial trees contribute to our already overburdened landfills. The methods consumers choose to dispose of their trees, as well as how long they choose to keep and use their artificial trees, also figure into calculations of which is the more sustainable option. A consumer needs to reuse an artificial tree for 5 - 10 years in order to establish an environmental impact lower than that of real trees. One study stated an artificial tree would need to be re-used for 20 years to have this effect. On the disposal side, real trees seem to come out ahead. Artificial trees are generally non-biodegradable and will languish in a landfill for centuries, laced with petroleum-based chemicals. When disposing of an artificial tree, consider donating it to a charity, a needy family, or a re-sale store. There may also be recycling possibilities available depending on where you live. Still, the more than 50 million artificial trees in use in the U.S. (as of 2010) have to go somewhere at the end of their lives, and they, unlike real trees, cannot become mulch. Just because real trees are biodegradable does not mean the landfill is an environmentally conscious disposal solution for them. Items in a landfill biodegrade very slowly and take up precious space. With real Christmas trees, there are many "Treecycling" options. When I was a kid in western Michigan, we had a Christmas tree graveyard in the woods behind our house where our holiday trees when to await their fate as firewood. When I lived in New York City, a good friend sought out real trees to be chunked up and given as toys to the orangutans at the Bronx Zoo. At Eastern Market in Detroit, any unsold Christmas trees as the end of the season are turned into mulch for the farmers. There are several options out there. The landfill should not be one of them. The most common indictment levied against artificial Christmas trees is the fact that they usually contain PVC and often lead. That is enough of a concern for me; I don't want my baby crawling around beneath a tree that might contain lead (or PVC). But what about pesticides? Christmas trees are farmed just like any other crop. The plus side of this is that when you cut down a live holiday tree, you're not contributing to deforestation, you're simply harvesting a crop grown for that purpose. The downside is that many tree farms use "contemporary" farming practices - meaning pesticides and chemical fertilizers. I don't really want my baby crawling around in that, either. My options are then to either declare this one a toss-up and base my decision on the other factors (and keep my baby well away from the tree, which is about as easy as keeping my cat away from the tree); or to seek out an organic tree farm or an artificial tree company that does not use those chemicals. There are environmental and social benefits to tree farming. According to Earth911, "A single farmed tree absorbs more than 1 ton of CO2 throughout its lifetime. With more than 350 million real Christmas tress growing in U.S. tree farms alone, you can imagine the yearly amount of carbon sequestering associated with the trees. Additionally, each acre of trees produces enough oxygen for the daily needs of 18 people." Further, more than 100,000 people in the US are employed by the live Christmas tree industry. There are also jobs created in the US by the artificial tree industry. There are a few a few US producers of artificial Christmas trees. These include, Christmas in America, New Jersey's Holiday Tree and Trim Co., and USChristmastree.com. A few years ago, we hatched a plan to have an indoor tree for all holidays. We purchased a contorted filbert for this purpose one spring. Sadly, it succumbed to aphids just as it was sprouting leaves. Still, a year round potted holiday tree is an idea I'm fond of, and one we will probably try again in the future. Another popular alternative is to purchase a small potted tree and then transplant it outside in the spring. 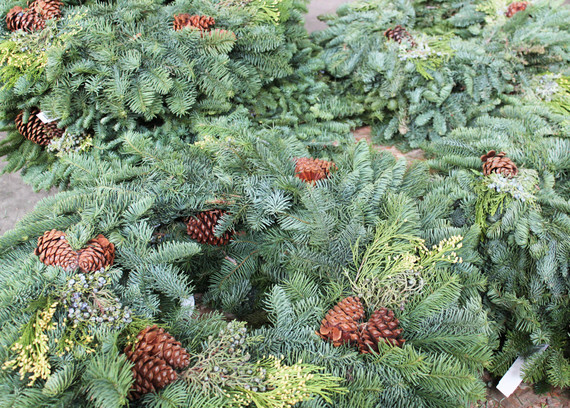 You can purchase a potted pine tree at most nurseries that will survive the holidays in its pot and can then become a thriving part of your home landscaping. The Daily Green also recommends decorating an outdoor tree instead of bringing a tree into your home. This isn't the ideal alternative for me (or my kids! ), but for some people it might be just perfect. I do remember when I was a kid, we used to run all the extension cords in our house (an my dad was a carpenter, so we had plenty) way out into the woods and string up a white pine with colorful lights. Then we would make balls of birdseed and peanut butter with paperclip hooks to decorate that tree, our own special holiday offering to nature. And I remember many winter evenings gazing out our frosted windows at the twinkling lights way out in the snowy woods. In the real vs artificial debate, real trees still come out ahead in my book. Where we live in Detroit, it's pretty easy to Make it a Real Michigan Christmas. If you live in an area where real trees are hard to come by or require a lot of travel, the answer might be different for you. Either way, please keep in mind that there are a lot more ways to green your holidays than simply choosing the right tree for you. Did you know that the lights you choose to put on your tree actually have a much bigger impact than the tree itself? A switch to LED lights is a major step toward sustainability this holiday season. LED lights use about 1/6 the amount of energy that "traditional" Christmas lights use. Just make sure you recycle those old lights! "Americans throw away 25 percent more trash during the Thanksgiving to New Year's holiday period than any other time of year. The extra waste amounts to 25 million tons of garbage, or about 1 million extra tons per week! If every family reused just two feet of holiday ribbon, the 38,000 miles of ribbon saved could tie a bow around the entire planet. If every American family wrapped just 3 presents in re-used materials, it would save enough paper to cover 45,000 football fields. The 2.65 billion Christmas cards sold each year in the U.S. could fill a football field 10 stories high. If we each sent one card less, we'd save 50,000 cubic yards of paper." This year, consider sending digital holiday cards, purchasing paper products made only from 100% post-consumer recycled materials, and re-using other paper products to make cards and wrapping paper. There are dozens of templates available for converting cereal boxes to gift boxes, plastic bags to festive bows, and more. Urban Earthworm features a long list of alternative gift card and wrapping paper ideas, including my favorite - homemade seed paper! What gifts you give this year and where they come from also have a huge impact. If you can avoid giving "stuff," that is always a good idea. I don't really need any more Harry Potter or Dr. Who memorabilia (really, I don't...), but a sessions at the local areal yoga gym or someone to do the dishes for me (especially that last one!) would be ideal. The list of non-material gifts is nearly un-ending and is only limited by your creativity. Shopping local is another key way to reduce your impact this holiday season. For those in the Detroit metro region, the local and hand-made gift possibilities are endless. From the Detroit Merchantile's Merry Market to Michigan Artisans, there are few excuses not to shop local this season. Thrift and re-sale shops are also a great alternative, a built-in form of recycling. I'll never turn down a thrift-shop pile of books! And, of course one doesn't want to overlook all the local offerings at Eastern Market. If you must purchase online, consider purchasing from a charitable organization. Nearly every charity offers gifts for sale, with the proceeds going to benefit the works of the organization. There are also sites like The Animal Rescue Site and Global Girlfriend, which bring together a huge selection of items with a portion of the proceeds going to charity. Lastly, always keep in mind the costs of transportation. The fewer shopping trips you take, the better you are treating the environment. If you can walk to the stores or take public transit, all the better. If not, consider trying to consolidate all your shopping into one trip. Happy (and Green) Holidays to you!